And the lack of options, as in, our city doesn't even have a public swimming pool. We took some lessons last fall through Community Education at the local Jr. High. We spent the summer having a little bit of water fun, and these kids have no fear of the water - which is ok...but now it's time to buckle down and get serious about this. Is one REALLY better than another? Community Education costs costs $60 for 8 lessons. Swim Lessons at the Y cost $95 per session per kid, which is 7 lessons. (You can save $60 per kid per session, if you pay the Y's $115 a month family fee!). And Foss Family Swim School - $144 for 8 lessons, PLUS a $35 'administrative cost' per family. 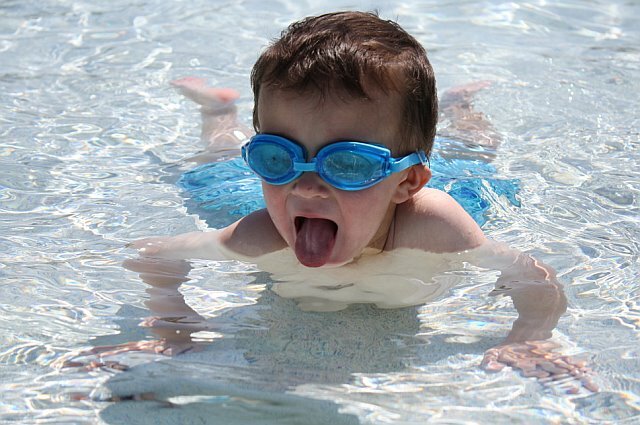 So...Have you signed your kids up for swimming lessons? Were you underwhelmed or overjoyed at what you chose for swim sessions? Did you have great success at one of the above mentioned swim classes? What makes one so much better than (and expensive than!) the other? Where does a Family get the most bang for their swimming lesson bucks? Baby J is taking lessons at the Courage Center in Golden Valley. We've had three lessons so far and LOVE it. The water is 92 degrees so it's toasty warm, which was most important to me since Baby J is still young. It's $85 for ten lessons - not bad compared to Foss. There's a ten month old in the class whose taken two other sessions and she knows how to paddle, kick, jump in and put her face, in so babies definitely can learn! Everyone I know that has done lessons there loves it so I think we'll be there for years - I just can't stomach the cost of Foss. @Buck - McKenna is one of those water babies - Remember last summer at Goodman's and she was all bobbing around under water? Incredible. I realize you get what you pay for - but is Foss REALLY that much better? I signed us up for 3 sessions each kid at the Y to take advantage of their current promo - but I almost had a heart attack shelling our $400 for the sessions...Here's hoping it goes swimmingly! I didn't even know Courage offered lessons - and you are right - the water temps make all the difference too! Community Ed = FREEZING! I also looked into all you mentioned here and I like this. It's reasonable, the staff seem to take their jobs seriously. They listen when I say things like, "My kid's not afraid of the water and I need her to be safe and smart." We first did parent tot and while I thought they moved slowly, I realized she was making progress in floating on her back, blowing bubbles in the water and moving her arms and legs with purpose. Now she's in the next level and I can watch, rather than participate. I like that the staff are patient and persistent with these toddlers, so I really like it. Overall, I'm impressed with the way the program is run and I'm impressed with the teachers. I can't say that about every program we looked into. My two children (now teens) were taught to swim in the backyard pool of one of my friends. She had been a swim teacher at one time, and was considering hanging out her shingle again. She graciously offered to teach my children to swim for free to give herself a chance to brush up on her techniques. Both children caught on in no time and are excellent swimmers today. She has taught many more children since then, right there in her backyard pool. Win-win, I'd say. I learned how to swim in a river with a strong current, rocks on the bottom, and while wearing tennis shoes. So did all of my cousins. When I was 14, I signed up for lifesaving class, and was a lifeguard at 15. My kids learned to swim by being in the pool with me ALOT all summer. No water wings for false security. I think that's dangerous. I stayed with them all the time. Swimming and swimming and swimming is how you learn to swim. Just like reading. You don't learn to read from lessons. you learn how to read from reading. In my opinion, little kids learn more about swimming by going to the pool with their parents than they will ever learn from lessons. Now I'll back up:) I'm not anti swimming lesson at all. The swimming lessons are to perfect strokes, etc. after the kid can actually do the basics. This is just another one of those things that marketing has convinced parents they need. It drives me nuts, can't you tell? Trust me...I'd LOVE to skip the lessons - but learning to swim isn't a choice in my book - and our bathtub isn't a deep enough watering hole to teach them ourselves! I feel that kids are ready to swim when they are ready. My oldest HATED the water. Tears, screams and then this past summer at 7 years old, she just decided it was fun and swam and is doing really well. My now 5 yo just jumped in a 2 and has always been a fish. We have done community ed swimming(i.e the cheapest) for 4 summers and 1/2 the time my eldest just hung onto the side and screamed..but oh well. And we go to the pool a lot. We will continue comm ed again this Summer and continue to swim as much as we can. I have no interest in super formal swim training though..and will not pay for it.